Runners are obsessed with detail, detail of diet, gear, pace, weather and so on. We search for explanations for a good or bad performance, and try to find answers in the tiniest things. So it is important for me to record that I ate porridge for breakfast as I usually do before a race on the morning of the Hastings Half Marathon, but with my toast I had marmalade (my own, and very good it is too) rather than the usual race-day honey. Similarly, I need to tell you that when I put on my usual pair of shoes a lace broke and, rather than lose time replacing it, I turned to another pair of shoes, well-worn, but not the ones I’ve been wearing lately. There are few public places in this modern over-regulated world where a man can stand with his hand down his shorts without fear of a prosecution or a lynch-mob, but the changing tent at the start of the Hastings Half Marathon is one. On a drizzly Sunday morning, in a mêlée of legs, arms, rucksacks, lycra, trusses and supports for every joint and protuberance of the human body, the tent is full of the smell of Ralgex and runners of every shape, size and fitness level. I create a beachhead among the bodies on the marquee floor and began to change, applying Bodyglide liberally. I spot some of my fellow Seaford Striders and join them: thirty of us complete this popular race. I make my way to the start; I believe the race has 5,000 entrants, and around 4,000 of those have turned up on the day. I find the board for those who expect to finish in tow hours and wait, cursing the weather forecasters who had suggested it might be warmer and drier. I fall into conversation with the man next to me. He asks about the Seaford marathon, to be held in August, and it turns out that he is a member of the 100 Marathons Club; not only that, he is heading for his three hundredth. Words fail me. We talk of marathons, though my experience of ten cannot match his, and of the wearing of iPods at races. Then the start, barely noticeable as far back as we are, and we shuffle towards the line. The first mile at Hastings is congested, and takes one up a hill by a railway station, and back down past the first of many churches on the route. Hastings does seem to be a church-ridden town, though I should not be ungracious, as the congregation at this one stand outside singing hymns at us to spur us on. The second mile includes another short ascent, and then a long run along Harley Shute Road; here, as all along the length of the race, spectators sit outside their houses offering fruit, orange segments and half-bananas, and jelly babies. Then the route turns west, and there’s a descent to the first water station at mile three. I like to take descents at speed, using gravity to my advantage, and find myself having to hop on and off the kerb to dodge slower runners in my path. Now the Queensway hill starts. It is by no means a terrifying hill, though it goes on for a mile or two. But I have seen runners, either ill-prepared or those who have gone too fast at the start, come to grief here. One year I ran past a team of army runners, tough young men, who were in discernable difficulty and pain as they went up. At mile five a clock by the side of the road records gun times, and I cheer up when I see one of the Runners World pacemakers, though without glasses I can’t tell which pace is written on the small coloured card held in a cleft stick. 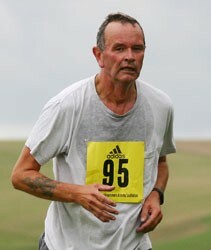 Fortunately another runner confirms to me that it is the ten–minute mile pacer. I feared it might have been the eleven minute mile one. I remember the joke about a First World War soldier who, overcome by fear, runs back through the trenches from the front line. He runs past an officer who stops him and says, ‘damn you, private, don’t you salute when you see a general?’ ‘Blimey’, says the soldier,’ I didn’t know I’d run that far’. At mile six we pass the Conquest hospital, and a chorus of staff and patients ring bells and beat pots and pans, though this year they seem to have been forbidden to stand on the roundabout. And then, soon after, we reach the half way point. At mile seven I hear a shout, ‘here come the police,’ and look behind me to see a team of half a dozen runners from Sussex police. In slightly questionable taste, they carry riot shields and truncheons, occasionally thumping their truncheons on their shields. It’s a good job Hastings is not a coal-mining town. From miles eight to ten there’s a steady descent, through residential areas, past pubs and the fire station, with the occasional ascent thrown in to trap the unwary. Onlookers vary from the raucous crowds outside the pubs to the more bohemian who sit on their steps playing bongos at the runners. Now we run down through the Old Town to the sea and begin the long run west, after a brief trip east to the turning point. I’m hungry and the fisherman’s huts here, selling smoked and other fish, seem awfully attractive. My foot is starting to hurt and I harbour uncharitable feelings towards my fellow runners. A blameless, if rather drippy, young couple annoy me the most. They are run-walking. When they stop to walk they hold hands; I overtake them, wishing on them STDs of the most obscure and painful type; then they start running again and overtake me; they walk once more, billing and cooing in a nauseating way; I overtake them; and so on…. Towards the very end I manage to coax a little more speed out of my legs for the final few hundred metres. I go through the line and receive my horse-brass, the idiosyncratic medal awarded here. Then a drink of water and the feeling of anti-climax that comes after every race. So, I finished, I was slow, but with one run a week for training, I was not going to be fast. What next? The race was won by Ben Fish of Blackburn, who finished in 1:07:08. The first lady was Jessica Macrory of Winchester and District AC,in 1:21;31. More modestly, I finished in 2:11:32, 2915th out of a field of 3992 finishers.